The Green Sea Turtle is distinct from other marine turtle species because it has a single pair of scales in front of the eyes, as well as a serrated bottom jaw. It has an oval shell (carapace), which varies in colour from olive to black, with swirls and irregular patterns. The undershell (plastron) is pale yellow or orange in colour. 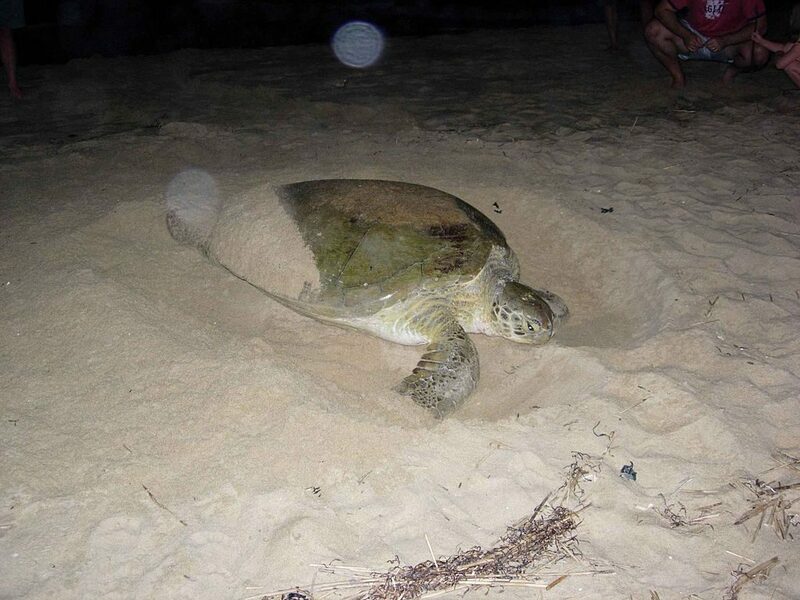 Green Sea Turtles lay their eggs on beaches, burying them in the sand, and hatchlings make their own way to the water. It isn’t certain where the young turtles spend their early days, perhaps drifting in the open ocean, but later they find their way to feeding grounds where they forage on seagrass and marine algae. 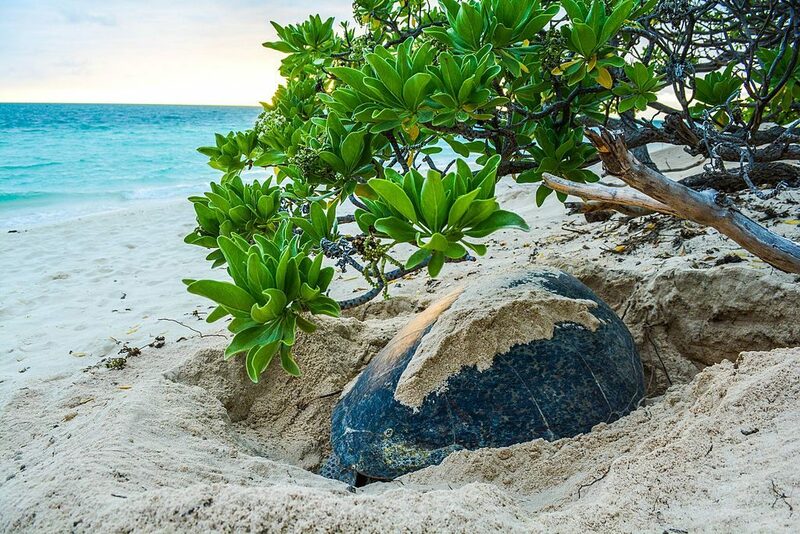 Green turtles are slow maturing and long-lived, breeding for the first time between the ages of 26 and 40 years.The adult males and females travel huge distances between feeding and nesting areas every few years, as each female will only breed once every few years. When she does breed, she will make up to 9 nests in that one season. Green Sea Turtles live in tropical waters around the equator, and to a lesser extent in the sub-tropical waters to the North and South. They range over huge distances and nest in over 80 countries. Green turtles suffer from over-harvesting in many areas around the world, for both meat and eggs. Further problems result when nesting beaches are developed or used for sand extraction. In particular, artificial light on nesting beaches will divert newly hatched turtles from heading toward the water, with fatal results. Like other marine turtle species, green turtles become entangled with fishing lines and equipment. A wide range of non-sustainable fishing techniques are to blame, including dynamite fishing and drift netting. Green Sea Turtles also increasingly suffer from Fibropapilloma disease, which causes tumours and has been linked to marine habitat degradation. In 2004 the IUCN estimated that the number of nesting females had fallen by at least 48% over the last three generations and judged that the species was Endangered.